WD's My Cloud EX5 certainly has the foundations of a decent and solid NAS system, and it's ruggedly designed and well thought-through. 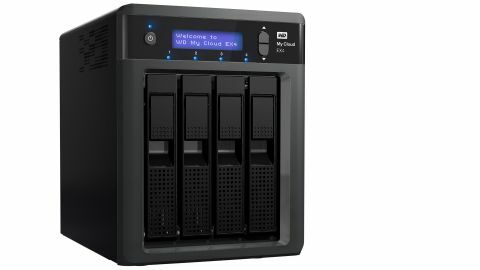 There's a huge, ever-growing range of Network Attached Storage (NAS) drives on the market at the moment, and WD's My Cloud EX4 is taps into the 'prosumer' audience in terms of price and features. As a result it's a drive which could find a place in both a technologically-driven home and a small office. Our sample was supplied with 8TB of storage in four 2TB drives, but it's also available in 12TB and 16TB variants, as well as a barebones version if you've got an excessive number of hard drives stashed in a drawer somewhere. The drives supplied with the WD My Cloud EX4 are specially designed by WD for NAS drives, and they're said to improve reliability and protect data better. We rather like its abrupt, chunky design, and it looks more like a mini server rack (intentionally, perhaps) than the sleeker white boxes from the likes of Synology or, indeed, WD. At the front you'll find four bays for the drives, each of which features a drop-down door which neatly unlatches and lets you pop the drive out by pressing it. It's a completely screwless design, but while the drives feel like they're solidly held in place there's no locking system, so a sticky fingered passer-by could nab one if they were so inclined. Here there's also a small backlit LCD which supplies the drive's vital stats: free space, fan speed, temperature and any diagnostic messages. A pair of vertical arrow buttons sit to its right, but, alas, these can't be used to control the device and are merely there to flick through the various pieces of information. There are also LEDs for each drive bay, and turning on the drive and watching them illuminate while the platters gently whirr to life one by one is kind of reassuringly serene, like sitting on a jumbo while the engines spin up. Each and every light can be turned off in the software, too, which comes in handy if you're using it in the same room as your TV and want to envelope yourself in a blockbuster. WD obviously has a fetish for doubling things up, and round the back you'll find two USB 3 ports, two Ethernet ports and even two power ports. Most drives include more USB ports, but we've actually found we use them quite rarely, so two is enough. The second Ethernet port allows you to speed up your network connection, and the second power port lets you connect an additional power supply just in case the first one fails. There's even the option to add an Uninterruptible Power Supply (UPS) if you're seriously worried about your electricity failing. Despite its rather business-oriented looks, the WD My Cloud EX4 includes support for media streaming via TwonkyMedia server, and an iTunes server for storing and listening to music and movies. As ever, you'll need a third-party app to access iTunes via an iPad or iPhone, which still makes absolutely no sense. The drive's settings are accessed via a web page, which is a common feature of NAS drives. It's nice and simple, with a dark colour scheme, a big typeface and large icons. The design makes it as accessible on mobile browsers as it is on a computer's, and we love the ability to see how much storage space you've got left and your network activity all on a single page. There were, however, a few occasions where the software would become completely unresponsive, which was rather annoying. Here you can add and remove users, who can be set up with administrative privileges, view your shared folders and authorise cloud access. The Storage menu allows you to switch between Raids 0, 1, 5 and 10, which all offer different ways of backing up and duplicating your data. It's worth noting that switching between the various arrays wipes your disks, so research what's best for you before you set up the drive.